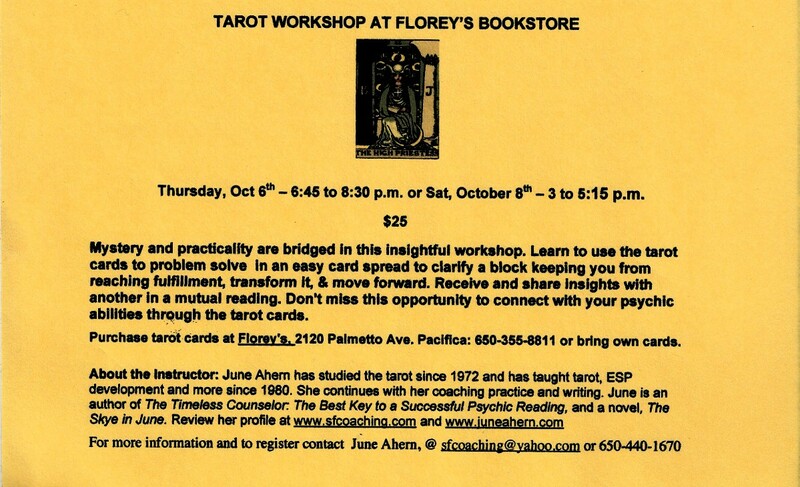 Tarot Card Workshop At Florey's! 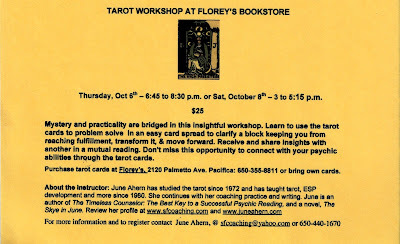 June Ahern will be the instructor of two introductory Tarot card classes at Florey's Books. A fee of $25 will be collected by Ms. Ahern. Mystery and practicality are bridged in this insightful workshop. Learn to use the tarot cards to problem solve in an easy card spread, to clarify a block keeping you from reaching fulfillment, transform it, and move forward. Receive and share insights with another in a mutual reading. Don't miss this opportunity to connect with your psychic abilities through the tarot cards. Some cards are in stock at Florey's now, feel free to order a deck if you like, or bring your own to the class. 'Art Recreation Time' Children's Art Class Begins Oct. 5th! New Event Starting October 4th at Florey's! Florey's Books invites you to our new ongoing series, "Speakeasy - Tuesdays at Florey's". 2nd Tues: Stories- your own, or favorite short stories. 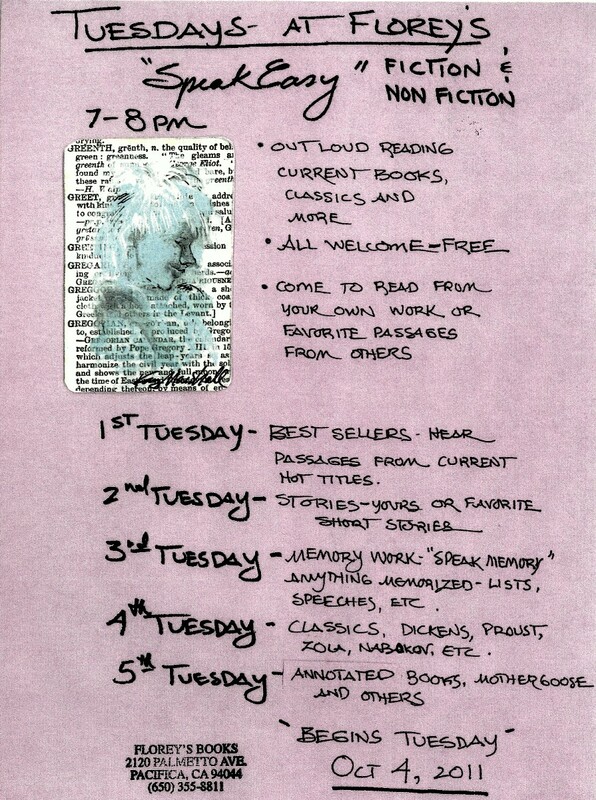 3rd Tues: Memory Work-'Speak Memory' anything memorized, lists, speeches, etc. 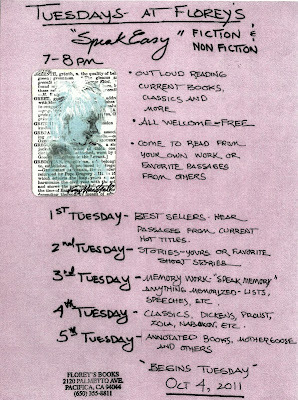 4th Tues: Classics- Dickens, Proust, Zola, Nabokov, etc. 5th Tues: Annotated Books- Mother Goose, Alice in Wonderland, etc. Please come and share your love of books and reading. Introduce others to books they may inot have been exposed to. This series is free and open to the public. We hope to see you. Poetry in September* at Florey's! *Next, is the Poetry at Florey's event: A special note about this event: although normally the Poetry at Florey's event is on the final Saturday of the month, this month Fog Fest is occuring that weekend, so the event has been moved forward to the first Saturday of October so as not to conflict. The featured poets this month are: Scott Caputo and Sherri Rose-Walker. The featured poets will be followed by an open mic period. Open mic sign-up is first come, first served. This event is also open to the public and free of charge.